While there’s hardly anything to get excited about Royal Enfield currently, except the Continental GT may be, I did accept my cousin’s invitation without any hesitation when he offered me to keep his recently bought Royal Enfield Desert Storm 500 for full 1 week. If I am asked today, I would say that the Continental GT is the most beautiful bike in the RE stable followed by the Desert Storm. The matte finish sand color really makes it standout from the rest. The color scheme, without any graphics, is so good that the bike has immense road presence. I live in Delhi and my 7 days with the Desert Storm included the office commute of over 60 kilometers daily and some weekend blasts to the nearby Gurgaon-Faridabad expressway. 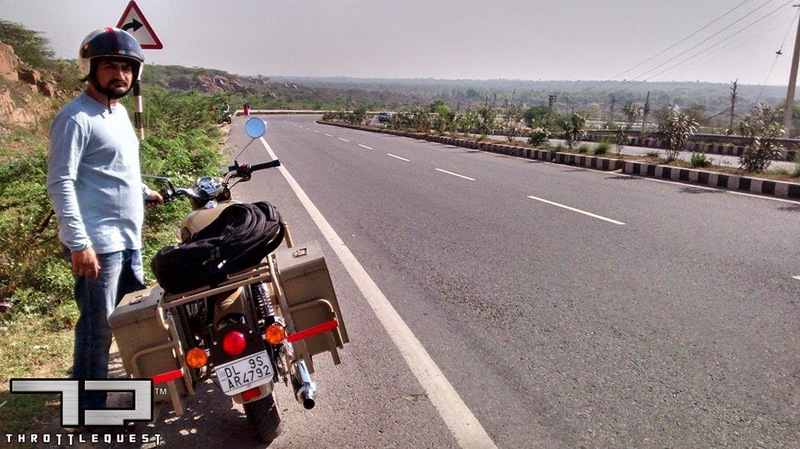 This road that connects the two cities of Haryana has some decent corners and has elevation changes as it passes through a ridge. It’s a good place to go and have some quick weekend fun when the traffic is minimal. Many riders with their mid to high capacity motorcycles can be seen on this road enjoying some early morning ride. Now I already have a RE Bullet Electra 5S, 2006 model, so the comparisons with the Desert Storm happened like an instinct. The other motorcycle I own is a Yamaha FZ-S which I currently ride daily. Even though RE still has a long way to go with the improvements in quality and engineering, it was still nice to ride one of their “relatively modern” motorcycles. The Desert Storm has a single cylinder 500cc Unit Construction Engine (UCE) which is air cooled, has two spark plugs and is fuel injected. The same engine powers the other 500cc Classics and the Thunderbird 500 as well. 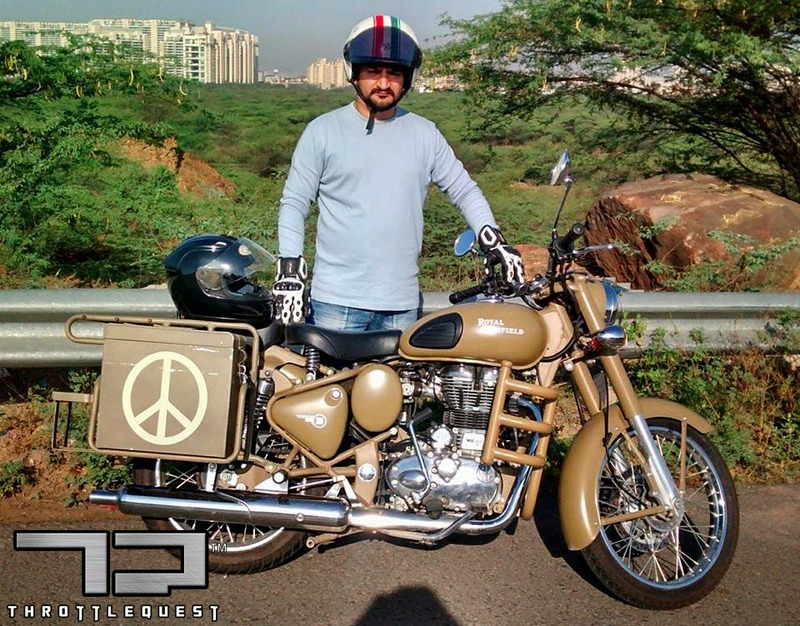 This is the most modern engine that Royal Enfield has ever built. The gearbox and clutch are integrated (thank God for that) and the whole unit appears compact compared to any previous engines that powered the Royal Enfields. All their motorcycles now come with the UCE engine in 350cc, 500cc and 535cc variants. The 535cc engine is exclusive to Continental GT and has a single spark plug for combustion and it is fuel injected as well. 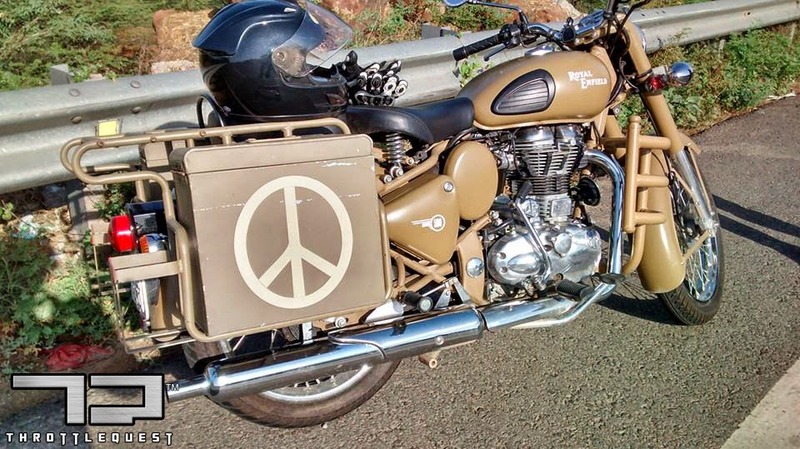 This particular Desert Storm has aftermarket panniers at the back and this gives it a beefier look. One of the things I loved about the motorcycle was the level of attention it gets on the road. While on move or stationary at a traffic light, almost everyone stared at the bike and their expressions would tell that they liked it. I think I would give all the credit to the unique paint scheme as the design is otherwise same as any other Classic. The color gives it a military bullet look. Whatever be the reason, the attention was nothing short of flattering and it made me feel like I am riding an imported motorcycle! One thing we need to remember is that Royal Enfield does not make motorcycles that you can go fast on. Well, the definition of fast can differ from person to person but considering other motorcycles in the similar engine capacity, we can say that REs are far from fast. However, compared to my Cast Iron equipped 350cc carbureted Electra, the Desert Storm is pretty quick from standstill and through the gears. For normal city traffic, it can be a fast motorcycle and many regular cars and bikes on the city roads can be overtaken without too much effort till the speeds of around 100kph. Flicking through the traffic is surprisingly good for an RE, even with the panniers that restrict riding through tight gaps. The tyres are round in profile and provided by MRF. The rear is 120mm wide on an 18inch wheel resulting in a relatively better handling machine. The speed is displayed by an analog style needle and there is no display to tell how many revs the engine is making because that is not important for such a motorcycle. For fuel, there is a low fuel indicator. 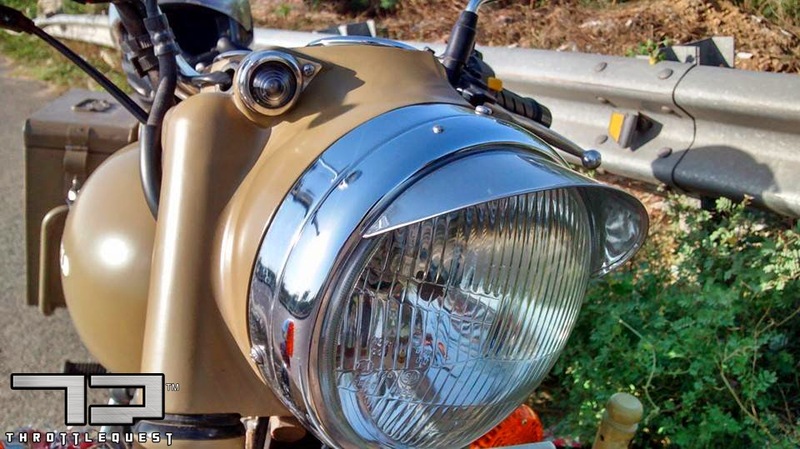 The Royal Enfields are pretty basic motorcycles without any technological wizardry that is, otherwise, steadily becoming common in motorcycles of today. These are standard style bikes endowed with the feeling of nostalgia. Even when the handling is ok, there is no thought given for centralizing the vehicle weight. While the bike remains easy to ride, the handling is top-heavy and the bike is already heavy at 187kgs ready-to-ride. This feeling becomes worse if the tyre pressure is below the required level. The heavy setup of the panniers at the back resulted in a low travel rear suspension. While the ride quality complements the good (read smooth) road surface, there was hardly any travel left in the rear shockers for riding on less than perfect roads. 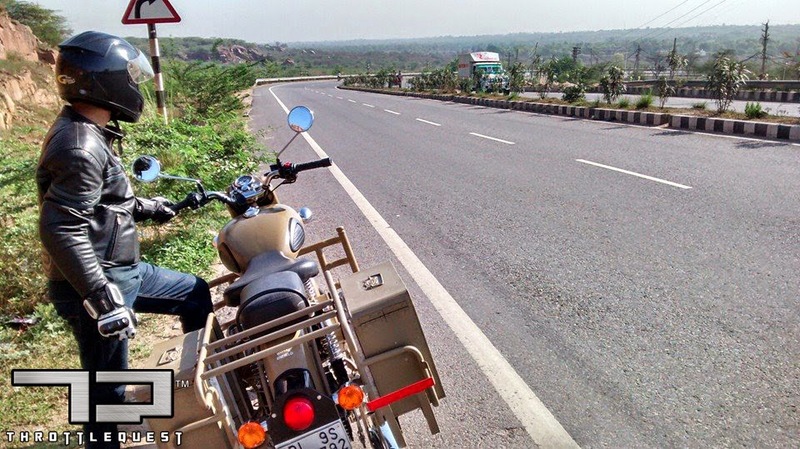 The pillion complained that whenever we hit a bad patch, it felt like the bike had no rear suspension. There is a 280mm disc brake at the front to bring this heavy weight to halt. The braking is good enough in normal situations; however, try and avoid situations where emergency braking is required as it can unsettle the bike quite easily. I feel much more confident on my FZ-S when it comes to braking. Hitting an open road like the aforementioned Gurgaon-Faridabad stretch allowed me to experience the consistent pace that it can maintain when the speed hits triple digits. While we all would agree that riding an RE is not about speed, but as dedicated riders we will always want to explore the limits of our bikes. While I mentioned that the acceleration is pretty effortless till 100kph and the bike feels quite relaxed as well, things become uncomfortable after that. Not surprising is it?! While the engine still has some juice left, the immense vibrations wouldn’t let me ride any faster. The handlebar is the worst affected at high speeds. The vibrations are so much it almost feels that the grip would explode. I had to keep a tighter grip to avoid losing the hold of the handle bar! It’s really that bad at those speeds. 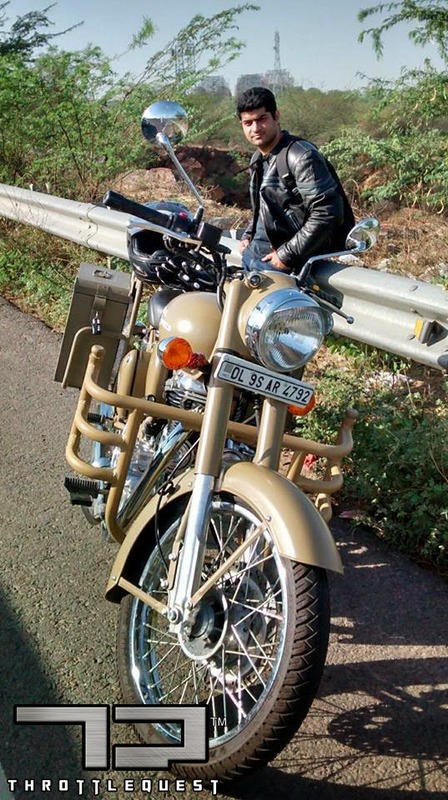 Royal Enfield really has to on work controlling such vibrations as they completely kill all the joy of riding. Even with a pillion, the handling around the corners was good and the bike remained stable throughout. I and my brother were impressed that the engine of the Desert Storm felt comfortable around triple digits with the extra weight of the pillion and the panniers. But the vibrations are worrying. I think the performance should improve a bit and the vibrations should come down when it is serviced as our bike was only 1 service old and it was due for the 2nd one. To conclude, I would say Royal Enfield has definitely made noticeable improvements in every aspect with the UCE engine while there’s still a very long way to go before it can stand shoulder to shoulder with other modern motorcycles of today. The frame and suspension are the other areas that are in need of upgrade. The bike needs better front suspension (from Thunderbird/Continental GT) and better swing-arm. All these changes will only make it a better motorcycle. I hope Royal Enfield has some good development plans for their current motorcycle lineup as some of them are really good looking motorcycles reminding of some classic motorcycles of the past. They are in the right direction, but it’s a long way to go.